Brooklyn is a very cool place to drink beer, eat and hang out. Manhattan is big and busy and tall; Brooklyn is its relaxed, quieter neighbour; chilled out, interesting, charming, cool. Both of our ventures across East River from Manhattan were to meet up with Lee from Hoptopia and Stevie from all sorts of beer things. Our first trip was Mugs Ale House, Barcade, Fette Sau and Spuyten Duyvil. The second trip was Brooklyn Brewery, Mugs Ale House and Barcade. This post squashes everything together into one round-up. Mugs Ale House is an open two-room corner boozer with drinking in the front and dining in the back. The bar is lined with colourful beer taps and the ever-present chalkboard listing all the day’s choices. It’s here that we had the best beer of the trip (and possibly the best, most perfect beer I’ve ever drunk) – Ithaca’s Flower Power. A juicy tropical fruit punch, a mix of mandarins (from the tin), peaches, mango; a smooth and gluggable beer with a bitterness that teases but never terrorises. We returned later in the week and drank more of it. And I’d fly straight back to New York in a heartbeat to get another pint of it. We also had pints of Captain Lawrence Pale Ale, Bear Republic’s Apex 7, an experimental IPA series which allows the brewers to play around with hop combinations, and Smuttynose IPA, so it was all about the hops. The beers were really good, too. Victory Prima Pils was excellent, although I didn’t like the Schwarz Pils so much – it was also more like a hoppy brown ale to me and I didn’t want a hoppy brown ale otherwise I would’ve ordered one. Sixpoint’s Bengali Tiger, a local beer, was the spiciest IPA I’ve ever drunk, with some tea flavours, herbs and spices and lots of tannic, oily hops. Founder’s Centennial IPA was exactly what I wanted: a fresh kiss of Centennial hops and a hug of booze. Sixpoint’s Diesel stout was the winner though: intense, oily, rich, roasty and bitter. A super stout. We finished our first visit (we went twice we liked it so much) by stepping things up and ordering Hudson 4-Grain Bourbon and some of Rogue’s whiskey (because Barcade also has a good spirit list, including those made by breweries – although not Dogfish Head’s, which I was looking for). The bourbon was rich and smooth but hot as hell and the whiskey was delicate and fruity. We washed these down with a magnificent monster imperial stout, as one does when he’s drinking terribly irresponsibly – Black Xantus. Wobbly legged and in need of a late meal, we stumbled around the corner to Fette Sau just as they finished serving dinner… which, luckily for us, coincides with when they start serving their evening menu. Five minutes later we were sipping beer and stuffing our faces with pork and burnt end beans (the beans were so incredibly delicious!). More bourbon next. Not knowing what the hell we were ordering we gave the barman a mission: up to $10 each, we want two very different bourbons to try. We got Eagle Rare 10 year old bourbon and Elmer Tree Single Barrel. One was rich and sweet, the other was light and floral; both were fantastic. I think we could’ve hung out in Fette Sau all day and night without getting bored. Then, thinking we knew where we were, over-confident from over-consuming, we decided to walk across the Brooklyn Bridge and get a night sight of Manhattan. About 45 minutes later, and still drunk, we were halfway over Williamsburg Bridge, which has no good views of the city and is just noisy and nasty. We then had to find a subway and schlep our way home. I don’t remember what time we got in but we climbed up the stairwell and out the fire exit of our hotel to see what the view was like from the roof. It was pretty damn awesome (I remember that part!). 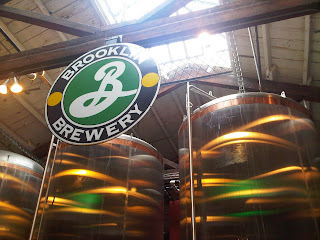 And then there’s Brooklyn Brewery (visited on day two, not at 4am). The open-to-public part is an expansive beer-filled warehouse, lively with a cool mix of drinkers in their twenties and thirties. All the beers were on tap, served in half-pint pours, plus some bottles of the Locals in the fridge: the Weiss was excellent, all creamy and bananary with just a little clove, and the EIPA was delicious, the only thing I didn’t drink... Lager. And I don’t know why I overlooked it. Silly me. They put on a tour which is fun and simple, just a discussion of the history and the present expansions, which is really interesting and free. Brooklyn is an amazing place to drink and eat. Barcade is very cool, Mugs Ale House has a wide choice of beers and the best beer we drank in the week. Fette Sau is unmissable if you like meat. Brooklyn Brewery is must-see for the beer geek. There’s also a really nice feel about Brooklyn as you walk around. We only wished we could’ve seen more of it because there’s so much we didn’t see. Top post - makes me definitely want to have an excursion brooklyn-ward in the future. 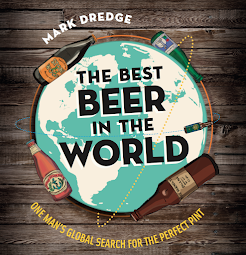 Looks like you found a bunch of cracking beers and bars, especially aesthetically - especially love the way the taps are arranged and the 'heads' on them that we just don't seem to get much over here. I love drinking liquor, but i don't like being drunk. So drink moderately. These two posts are awesome Mark. I'm heading to NYC next year so will definitely head for as many of these bars as I can. Only problem is I have to wait until next year...! What an amazing trip! I'm immensely jealous. Would love to get out to NY. The Sixpoint beers sound tasty as hell too. Do you know if we ever see them over this side of the pond? I really enjoyed this post and will be checking out all your tips.